I got my first Stitch Fix a week ago today. (I blogged my awkward pics and thoughts here, in case you missed them.) I have a few extra comments to make regarding the experience, if you don't mind. 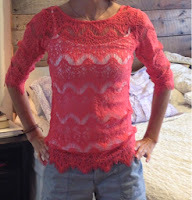 First of all, the decision was a difficult one but I ended up keeping the Pink Kassidy Open Lattice Tank and the Crista 3/4 Sleeve Lace Shirt. These two were clear favorites among friends/commentators as well as my husband, so it was a pretty easy choice. That meant the rest of my stuff went back. It was as easy as putting the stuff in the provided bag and sending with my husband to drop in our mailbox while he was mowing. Easy peasy, and there was no added expense involved to send the stuff back. I then "checked out" back on the Stitch Fix site. I need to throw out at least one bag of clothes. However, the second I begin to throw something out I think of some "brilliant" new way to wear it or some extraordinary circumstance under which it would be normal to keep it. What if we do a family photo-shoot in January and I must wear layers of blue and yellow clothes so that every layer matches and is color-coordinated? These are the questions that plague me and cause me to horde a bit more than I'd like. And this is why I'm tempted to post pics of myself in every love-it-or-list-it piece of attire I own. But I won't. I love you all too much to make you do that. However, if you are my close friend, be aware that you might get random pictures of me in a red dress or a blue-and-yellow striped shirt with a question: Yay or nay?